To deal with fear and anxiety, it helps to understand what the amygdala does and how it triggers alarms in the mind, and in the body. It monitors what goes on around you. If something happens that is unexpected or non-routine, the amygdala zaps you with stress hormones. 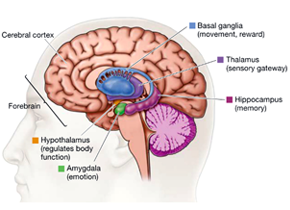 The first creatures to have an amygdala had no cortex. Since there was no thinking part of the brain, when the amygdala noticed something non-routine, the stress hormones caused an urge to escape. The creature just ran away. Later, when the cortex was added, stress hormones continued to produce that urge to run as before. But, stress hormones also activate the cortex. Upon activation, the cortex inhibits the urge to run, and assesses the situation to determine whether escape is necessary. After all, escape uses calories that will have to be replaced, and puts wear and tear on the body. Even now, when our amygdala notices something non-routine, we still feel the need to escape. But we are supposed to hold on until we have assessed what is going on. The amygdala is not nearly as smart as we are. We need to keep it from taking over. That can be easier said than done. Years ago, in 1908, two psychologists, Yerkes and Dodson, discovered that if stress hormones build up, the ability to think declines, and may completely disappear. To keep the ability to think alive and well, stress hormones have to be regulated. The ability to regulate is developed when we are very young, mostly prior to 14 months of age. When regulation is adequately developed, regulation takes place unconsciously and automatically based on many memories of being supported by caregivers whenever encountereing stressful situations. we don’t have any trouble keeping our wits about us. But when regulation is not adequately developed, it is easy for stress hormones to build up, and cause us to stop thinking. When we stop thinking, the urge to escape takes over. And if escape is blocked, we panic. The amygdala, though quick to be sensitized to what is dangerous, is slow to become desensitized what is safe. Here’s an example: a few years ago, I was throwing out some things that had been hanging around. I loaded up a wheelbarrow with an old computer monitor and some magazines. I topped the load off with an old rolled-up rug that, placed on top, hung over the edge of the wheelbarrow. Going uphill toward the dumpster, I was pulling – rather than pushing – the wheelbarrow. I was wearing a wrist brace. It was flesh colored, except for the bright red logo of the manufacturer. As I pulled the wheelbarrow, it began to tip. I shifted my grip and managed to keep it from tipping, but as the rug shifted, the rough edge of the rug rubbed against my wrist. I glanced down and instantly felt a shot of stress hormones. Had I been injured? No. The red spot was not an injury; just the red logo on the wrist brace. But faster than I could think, the red registered with my amygdala, It is always on alert for any sign of danger. I continued pulling the wheelbarrow up the hill. The wheelbarrow tipped again. Again, the rug brushed against my wrist. Again, as I glanced at my wrist, I got a shot of stress hormones. Five times the wheelbarrow tipped. Five times the rug shifted and brushed against my wrist. Five times, the amygdala reacted, just as it did the first time. The amygdala did not learn to not give an alarm. The amygdala is very quick, But it isn’t very smart. It doesn’t think. Sensitization takes places quickly. The amygdala learns quickly to respond to danger. But desensitization happens slowly. It takes time to retrain the amygdala – if that training is done by experience alone – to regard something as safe. Exposure, as a treatment for phobia, can be tedious. Most people don’t fly often enough for the amygdala to discover that it doesn’t need to alarm you when the plane moves unexpectedly. As you know, when the plane drops, nothing happens to the plane. Though there is news story every few weeks about someone being injured in turbulence, it is never anyone wearing a seat belt. In turbulence, an anxious passenger gets zapped with stress hormones. As stress hormones build up, thinking becomes clouded. if the anxious passenger allows it, the advanced cortex defers to the primitive amygdala. They mistakenly believe stress hormones mean danger. A pilot’s amygdala is desensitized to flying and to turbulence. Desensitizatiion leaves their thinking unclouded by stress hormones. They know from experience that turbulence is never a problem for the plane. They know if passengers are wearing a seat belt they will not be hurt. Pilots do know, however, that the flight attendants need to be told when turbulence is coming up. They need some time to stow the carts and get to their seat and strap in before it gets bumpy. Your amygdala is to driving as a pilot’s amygdala is to flying. Your amygdala is to bumps in the road as a pilot’s amygdala is to bump in the air. The amygdala is never gong to be as smart as you are. The only question is, are you smart enough to know you are smarter than the amygdala and, when it comes to flying, ignore it? Again, easier said than done. That is why we use the strengthening exercise. Though it is difficult to desensitize the amygdala – and to keep it desensitized – to flying, it is easy to use the strengthening exercise to prevent the release of stress hormones as well as to override the effects of stress hormones. Once you have used the strengthening exercise to train the mind to deal with stress hormones, your cortex can remain clear.